Last night Elon Musk announced that Tesla is working on a major software update for their electric vehicle fleet — the V9.0 (firmware ver: 2018.39) — and now this over-the-air software update has started rolling-out for early Model 3 owners which happen to be mostly Tesla employees and owners participating in the early access program. 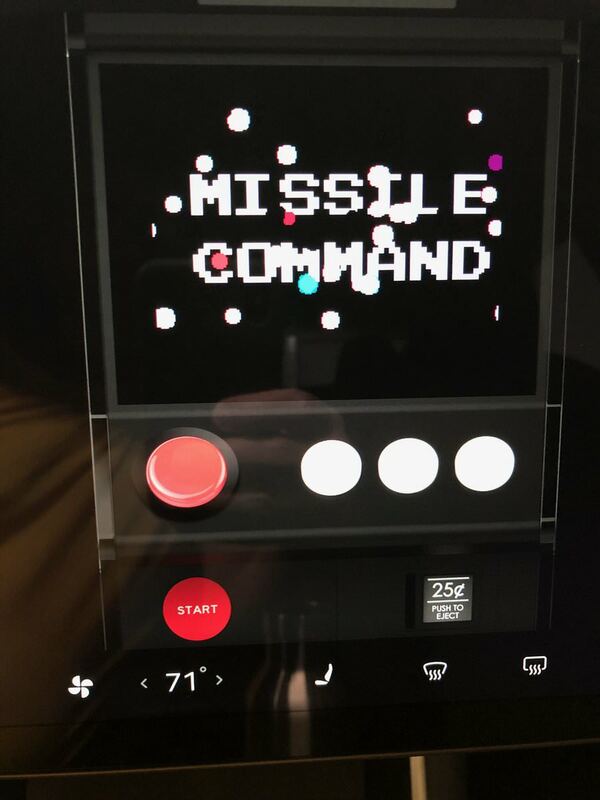 Marc Benton (@marc_benton) was able to grab a few screenshots of the user-interface, release notes and one of the promised Atari classic games ‘Missile Command’ (screenshots below). Tesla V9 software update is expected to release fleet-wide starting this weekend. 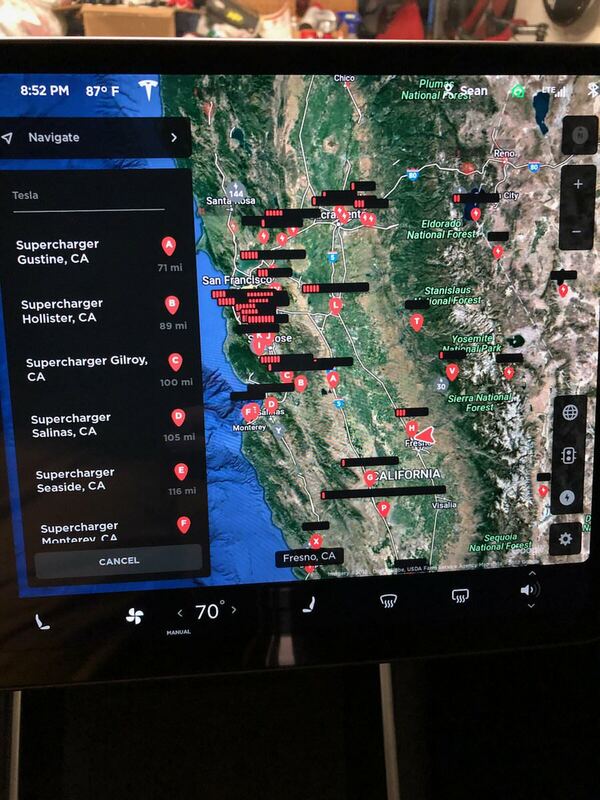 Tesla over-the-air software updates normally deploy in batches, so some owners might get the update first and for others it might be a delay. 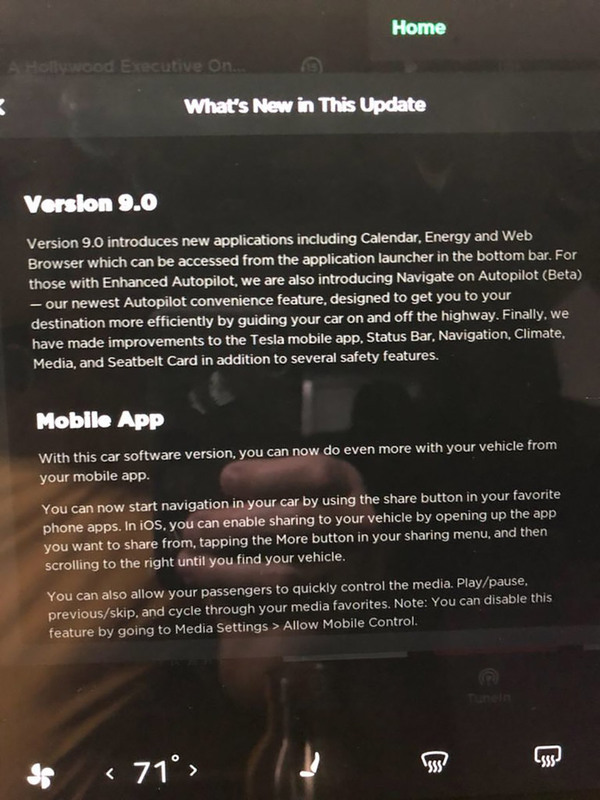 Tesla is making a giant leap with the release of the latest Tesla Software V9.0 (2018.39) with new features of safety, UI improvements and entertainment like the video game easter-eggs, climate control enhancements, Autopilot new features and enhancements, read the full detailed release notes below. Version 9.0 introduces new applications including Calendar, Energy and Web Browser, which can be accessed from the application launcher in the bottom bar. For those with Enhanced Autopilot, we are also introducing Navigate on Autopilot (Beta) — our newest Autopilot convenience feature, designed to get you to your destination more efficiently by guiding your car on and off the highway. Finally, we have made improvements to the Tesla mobile app, Status Bar, Navigation, Climate, Media, and Seatbelt Card in addition to several safety features. With this car software version, you can now do even more with your vehicle from your mobile app. You can now start navigation in your car by using the share button in your favorite phone apps. In iOS, you can enable sharing to your vehicle by opening up the app you want to share from, tapping the More button in your sharing media, and then scrolling to the right until you find your vehicle. You can also allow your passengers to quickly control the media. Play/pause, previous/skip, and cycle through your media favorites. Note: You can disable this feature by going to Media Settings > Allow Mobile Control. Whenever there’s a software update available for your vehicle, you can conveniently start the update from your phone. A notification will be sent to other drivers of your car, and they’ll have a few minutes to cancel the update from their app. Note: these features require mobile software version 3.6.0 or above. The Calendar app allows you to view your phone’s calendar for the current and next day. The Calendar is conveniently integrated with Phone and Navigation so you can dial into a meeting or route to your next meeting with a signel tap. 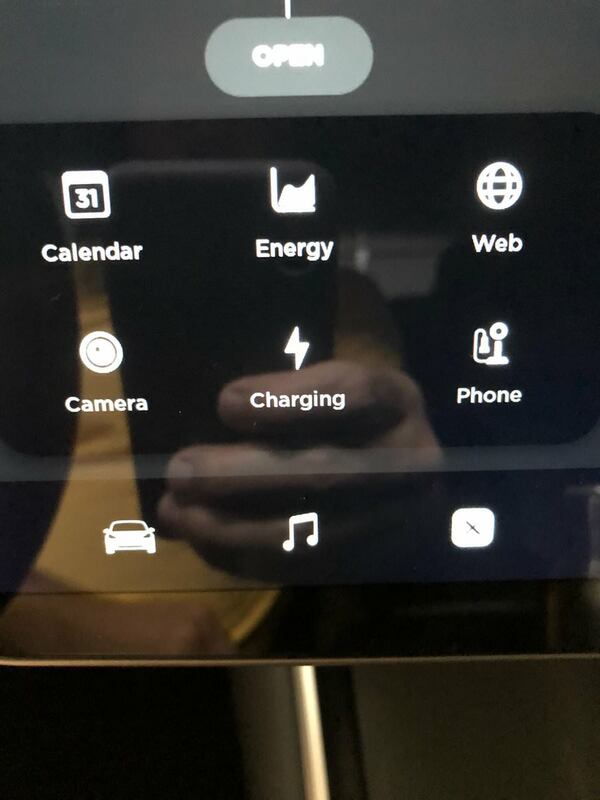 For events to appear, you must connect your phone to your car via Bluetooth and allow calendar access by enabling Calendar Sync in the Tesla mobile app. 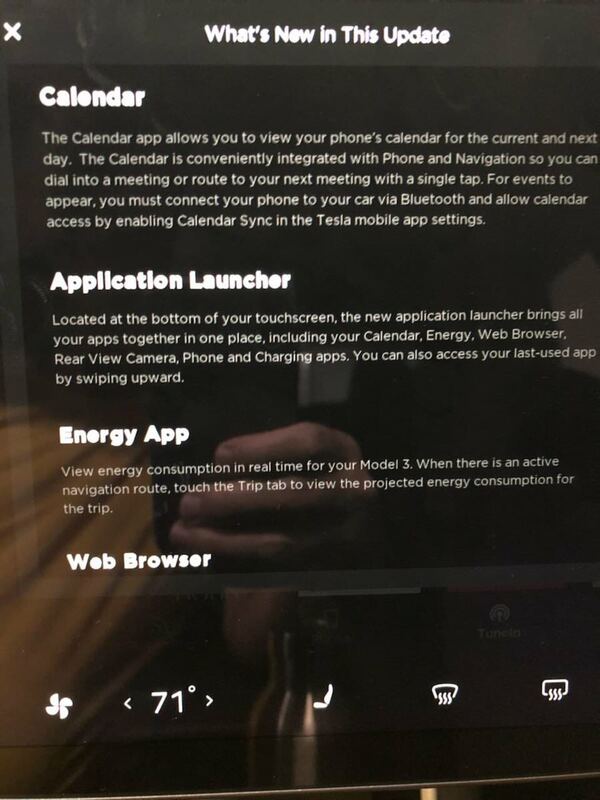 Located at the bottom of your touchscreen, the new application launcher brings all your apps ogether in one place, including your Calendar, Energy, Web Browser, Revew View Camera, Phone and Charging apps. You can also access to your last-used app by swiping upward. View energy consumption in real time for your Model 3. When there is an active navigation route, touch the Trip tab to view the projected energy consumption for the trip. Introducing Navigate on Autopilot (Beta) — our newest Autopilot convenience feature, designed to get you to your destination more efficiently by guiding your car on and off the highway. Navigate on Autopilot intelligently suggests lane changes to keep you on your route in addition to making adjustments so you don’t get stuck behind slow cars or trucks. To improve Navigation’s ability to provide relevant instructions, you can now select whether or not your vehicle is eligible for high-occupancy vehicle (HOV) lanes. When enabled, Navigation will route you though HOV lanes. When disabled, Navigation avoids routing you through HOV lanes. Tap the settings icon on the bottom corner of the map then enable or disable Use HOV Lanes as desired. The Web browser app allows you to access the internet. Navigate to your desired website by entering the URL in the address bar. Easily return to your favorite sites by adding them to your Favorite using the heart icons. The status bar has been rearranged to make the time and temperature easier to view at a glance. It’s now easier to direct airflow where you want it with the new Model 3 Airwave visualization. When you’re done, you can now simply swipe the Climate panel down to dismiss. The temperature settings on the bottom bar can now be controlled with a simple swipe: swipe to the left to lower the setting, or to the right to raise it. Tapping or pressing and holding the control will continue to work as before. As before, if you’d like to have different passenger and driver temperatures, simply unsync to reveal two temperature settings. Directions have been moved to the left side of the screen, and simplified to display relevant upcoming information—including highway exits, when applicable. Tap or pull down to see additional details in the full Trip Overview. Navigation settings including voice guidance volume can easily be adjusted by tapping the settings icon on the touchscreen map. The traffic view has been restyled to further highlight problematic areas. Roads experiencing slower speeds or delays will be emphasized with red and yellow outlines. On the radio, you can now tune directly to a station using Direct Tune. For example, enter “88.5” while you’ve selected FM and you can listen immediately. In Media Settings, the Options tab allows you to turn off explicit lyrics with the Explicit Content setting. The DJ commentary button for hearing music news on Streaming stations has also moved to Media>Settings. You can now toggle the Rear Seatbelt alerts to mark them as child seats. By adjusting the alert, the Seatbelt Card will only display once per drive cycle when triggered, removing the need to dismiss the alert multiple times. Acceleration is automatically limited if an obstacle is detected in front of your vehicle while driving at low speeds. Obstacle-Aware Acceleration can be enabled or disabled in Controls > Autopilot. Play Atari games in your Tesla. Tap the Atari logo in your easter egg tray which can be found by touching the Tesla “T” (top center of the touchscreen). To play, select a game from the menu, enter some quarters and press Start. You can also play in full screen mode while in PARK. Click/Tap images to load gallery/full-res versions.